Phillip Henry Barkdull was a talented modernist painter who never became famous due to his lifelong health problems. Barkdull was born on March 22, 1888, in a small farming community called Hatton, near Fillmore, Utah. He was a member of The Church of Jesus Christ of Latter-day Saints. He suffered from a hearing loss, bad sinuses, and migraines sustained from a head injury in his childhood. With no schools near his home, and his help needed on the farm, Barkdull did not attend school until the age of 23. He left the farm and attended high school at Brigham Young High School in Provo, Utah. He studied art and participated on the track team, despite his sickly nature. Barkdull went on to study art at Brigham Young University. 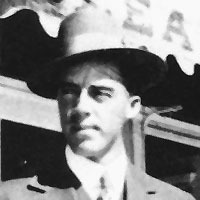 He was on the verge of receiving his degree when, in 1917, an old roommate invited him to teach art at Dixie Normal College in St. George. That, too, was postponed when he was inducted into the Armed Forces during World War I. Because of his poor health, he was discharged within only a few months and began teaching art at Hurricane High School. For six years he taught art in various schools throughout Utah. He was then able to move to Provo, Utah, where he taught arts, crafts, and design part-time at Provo High School and spent the summers attending BYU. He graduated in 1928 and continued teaching at Provo High for two years. He started summer classes at Utah State Agricultural College. He met artist Birger Sandzen who greatly influenced Barkdull with his neo-impressionist technique. He studied under Sandzen for two summers. Barkdull’s painting style was significantly different from the art known in Utah, but well-received in New York. 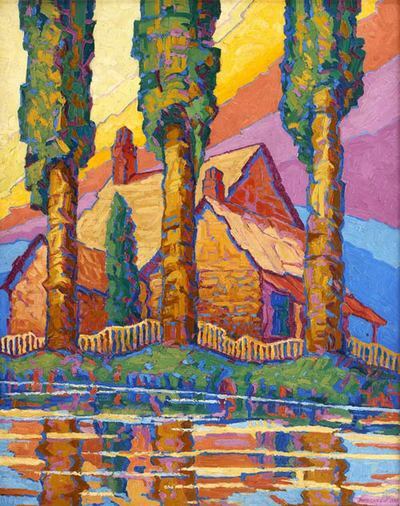 His greatest painting period of bold landscapes was from 1927 to 1930. In 1930, Barkdull was asked to fill a one-year teaching position at BYU. The Logan School District hired him as supervisor of arts and crafts. He also taught art part-time. His health forced him to retire from the school district in 1954. He continued to work as a private instructor. He began painting watercolors but never reached his full potential due to his health. He died on November 6, 1968. Barkdull was married to Evelyn W. Barkdull. This page was last edited on 15 September 2014, at 15:33.